BOSTON—One victim of Monday’s bombings at the Boston Marathon has been identified: 8-year-old Martin Richard of nearby Dorchester, who was attending the race with his family. His mother, Denise, and his 6-year-old sister, Jane, were severely injured. Richard's father, Bill, was hit in the leg by fragments of the bomb, while his older brother escaped serious injury. Massachusetts Rep. Stephen Lynch, who has known the family for 25 years, told Yahoo News that Bill Richard, who had run the marathon in the past but skipped this year because of injury, had taken his family to watch the race. The family had gone to get ice cream and then returned to watch runners along Boylston Street when they witnessed the first blast, according to Lynch. He said they immediately tried to move off the sidewalk into the street in an attempt to get away from buildings out of fear of another blast. That was when the second bomb struck, killing Martin Richard and severely injuring his mother and sister. Richard's father was hit by what Lynch described as “ball bearings” from the bomb, but was not severely injured, while Richard’s older brother, who has not been identified, was physically uninjured but has been severely "traumatized" by what he saw. “To watch all of that, to be there with them, it shows how random this violence is that one son was taken and one son was not,” Lynch said of the older brother. Lynch added that the family was “struggling as anybody in this situation would." 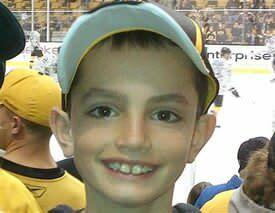 “My dear son Martin has died from injuries sustained in the attack on Boston," Bill Richard said in a statement Tuesday. "My wife and daughter are both recovering from serious injuries. We thank our family and friends, those we know and those we have never met, for their thoughts and prayers. I ask that you continue to pray for my family as we remember Martin. We also ask for your patience and for privacy as we work to simultaneously grieve and recover." A neighbor told the AP that the boy loved to play outside his home and climb trees. On Tuesday, a candle was burning on the family's stoop, and someone had written the word "peace" in chalk outside.